Primordial (1987-present) is a Black Metal band from Dublin, Ireland. Vocalist Nemtheanga (Real Name: Alan Averill) joined the band after seeing an advertisement in the Dublin specialist Metal store 'The Sound Cellar' in 1991. After Nemtheanga joined, the band started to pursue a darker direction citing influence from Bathory, Celtic Frost and the emerging Greek and Norwegian black metal scenes. Primordial was the first black metal styled band to emerge from Ireland with the release of their Dark Romanticism (1993) demo in the early summer of 1993. After a live 1994 soundboard recording from Dublin was sent to 'Cacophonous Records', the band was subsequently signed for the release of their debut album Imrama. 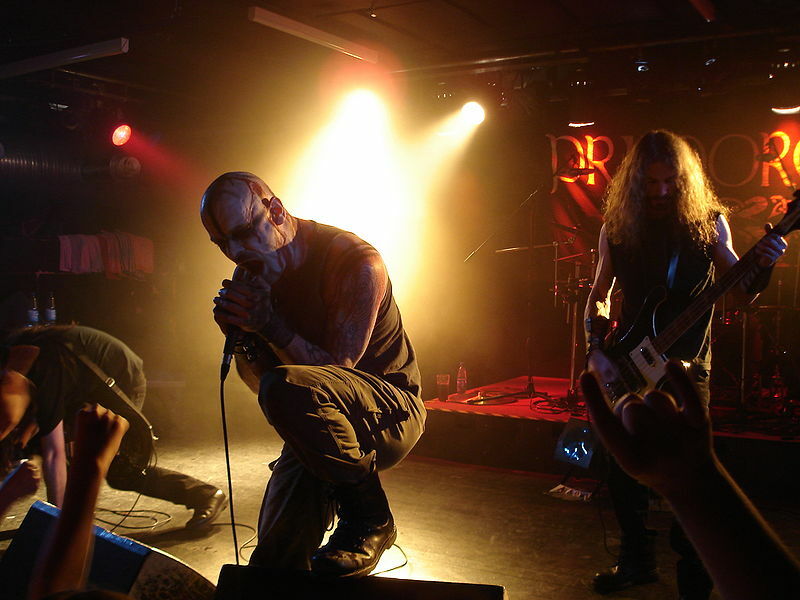 Although their debut album, Imrama, was in a more melodic black metal musical direction, they gradually came to refine their sound with A Journey's End (1998), which included the use of mandolins and whistles and a more epic style. The two subsequent releases, The Burning Season and Spirit the Earth Aflame (2000), showed the band's reflection of cultural geist and emotion, woven into black, Celtic, and folk metal musical styles. They then toured with various metal bands in the extreme metal genre, including Norwegian black metal band Immortal. They released their dark fourth studio album, Storm Before Calm, in 2002, but it was the band's fifth album, The Gathering Wilderness (2005), that turned out to be a much darker and bleaker record than any they had made before. In January 2006 the band played their first US show alongside Thyrfing and Moonsorrow at the Heathen Crusade Metalfest in Columbia Heights, Minnesota. The band's sixth album, To the Nameless Dead, was released on 16 November 2007. In November and December 2010, the band entered Foel Studio in Wales to work with producer Chris Fielding once again. The resulting album, Redemption at the Puritan's Hand was released via Metal Blade on April 22, 2011. In July 2014, Primordial announced their eighth studio album under the working title Where Greater Men Have Fallen. It is supposed to be released in late November 2014. Irish band Primordial at Lutakko (Jyväskylä, Finland) 2007. Photo by: Henrik Heino.